This is the second post in a 5-part series about tracking your fitness. In this post, I'll go through using a body fat scale. There are other methods out there to measure body fat %, but very few of them can be used at home on a weekly basis. That's why this method is the most popular for week-to-week tracking. Part 3: Understanding body fat %. Part 5: Other measurements you can use to track your progress. Getting consistent measurements out of these scales can be a little tricky. Set up the scale correctly. Body composition scales don't measure body fat directly. They have to make a number of assumptions about you based on a handful of things you tell it like gender, age, and activity level. These assumptions will lead to some uncertainty in the results, but it will be minimized if you configure the scale correctly at the beginning. More importantly, this error will be consistent over time so you can track your results over time. The scales use electrical resistance as the main measurement, so standing on the scale with rough or dirty feet can impact the results tremendously. (This was the main thing that gave me trouble when I first started using one. The measured results ranged from 15% to 40% fat. In reality, I was somewhere around 13% body fat.) To account for that, either clean and soak your feet for a few seconds before stepping on or take the measurement right after your shower. Also be sure to wipe down the surface of the scale before and after using it. 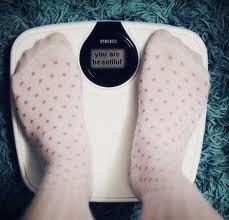 The scale assumes that any body weight that doesn't conduct the signal is fat, so it will assume any clothes you are wearing is body fat as well. So, no heavy blue jeans or soaked towel while you are on the scale. Any remaining contents in your digestive tract can have a significant impact on the measurements. The best way to account for that is to do the weigh-in first thing in the morning after going to the bathroom. There's no reason to alter your food intake for this at all, but it is best to squeeze in the measurement at the time that will get you the most consistent results. You'll find some variation in the number the scale gives you based on each of these factors, but that's just fine. At the beginning, I do suggest that you jump on and off the scale a number of times to convince yourself that you can get consistent and repeatable measurements. On to part 3 of the series! I'm a personal trainer in Baltimore City. I help people get in shape by keeping things really simple. I'll cut the clutter so you can take control.